Rev. 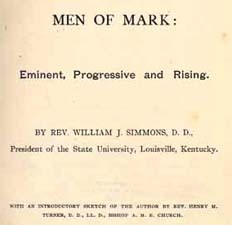 William J. Simmons, 1849-1890 Men of Mark: Eminent, Progressive and Rising. Men of Mark: Eminent, Progressive and Rising. Cleveland, Ohio: Geo. M. Rewell, 1887. Perkins Library, Duke University provided the text for the electronic publication of this title.